Former President Goodluck Jonathan and Senate President Bukola Saraki have joined leaders across the world to pay tribute to former Secretary-General of the United Nations (UN), Kofi Annan. Both leaders mourned the diplomat in a series of tweets on Saturday, hours after the news of his death broke. The Speaker of the House of Representatives, Mr Yakubu Dogara, and former Vice President Atiku Abubakar are also part of the leaders who paid respect to Annan. The Ghanaian diplomat died on Saturday morning at the age of 80 in Switzerland after a brief illness. He served as the seventh UN Secretary-General, from January 1997 to December 2006. He was also the first African to win the Nobel Peace Prize jointly with the United Nations in 2001. I am deeply saddened by the death of @KofiAnnan , a world-renowned icon of peace and diplomacy. He was a distinguished and accomplished international public servant and one of Africa’s most prominent diplomats. As the @UN Secretary-General, Annan introduced far-reaching reforms that reinvigorated the UN systems and positively impacted international relations. A consummate diplomat, Annan successfully managed the contending powers in the @UN and stood firmly for development, human rights, and a peaceful world; a commitment that earned him the Nobel Peace Prize. Even after leaving active service, Annan remained robustly engaged in promoting good governance, diplomacy, mediation, and humanitarian services. 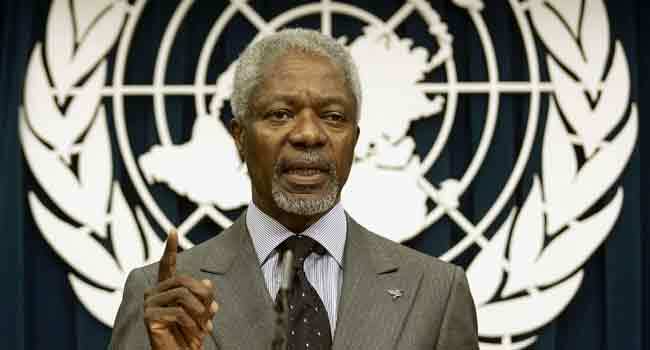 His demise is a sad loss to Africa and the World. -GEJ. It is with a great sense of loss that I received the news of the passing on of former Secretary General of the United Nations @UN, Mr @KofiAnnan. Even with the awareness that death is an inevitable end, even for great men, it does not reduce the feeling of profound loss. His contributions to the upliftment of the human race will never be forgotten. My heartfelt condolences go to his family, the Ghanaian government and the global community. May his soul find eternal rest. Kofi Annan, former @UN Secretary General’s indelible contributions to humanity will not be forgotten. He was a global statesman deeply committed to a fairer & more peaceful world. My condolences to his family and the people of Ghana. He will be sorely missed. – Atiku Abubakar.